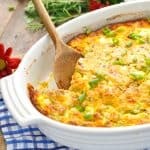 This easy breakfast casserole is the best I've ever tasted. Loaded with sausage, bacon, peppers, onion and cheese it's got everything you could possibly want in an egg dish. Spray a 9 x 13-inch baking dish with cooking spray and set aside. In a large bowl, beat together Bisquick, eggs, and milk. Stir in remaining ingredients. Pour mixture into the prepared baking dish. Cover and refrigerate for at least 6 hours (or overnight). When ready to bake, place the baking dish on the counter to come to room temp while you preheat the oven to 350F/180C. Bake, uncovered, for 45 minutes – 1 hour. Cooking for a Smaller Family? You can cut the ingredients in half and prepare the casserole in an 8-inch square baking dish. Alternatively, you can prepare the full recipe, but bake the ingredients in two separate 8-inch square casseroles. Eat one casserole now and save the other baked casserole in the freezer for later! Have leftovers? The cooked casserole freezes really well! Note: Recipe from my friend Sallie and adapted from Recipes and Remembrances cookbook from Etlan United Methodist Church.